Our organization is instrumental in offering a wide gamut of Special Purpose Conveyor Chains. This qualitative range is designed and manufactured by efficient team of professionals employing cutting-edge technology installed at our premises. Our valued clients widely appreciate our range for its precise construction, accurate dimensions and exceptional strength. With the aim to serve our patrons as par the exact requirements of our clients, we offer our products in both standard and custom-design form. 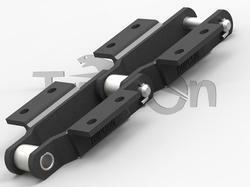 We are instrumental in offering a commendable range of supreme quality Special Conveyor Chain to the esteemed patrons. These offered conveyor chains are manufactured using premium quality raw material, sourced from some of the authentic vendors of the industry. Moreover, this range is precision engineered under the supervision of our quality checkers who make sure to deliver the ordered consignments at the clients' premises within the committed time frame. We bring forth for our clients a comprehensive array of Special Purpose Conveyor Chain. Extensively being used in Transportation and Conveying Bars, for their excellent strength and rigid conveying application. This range is designed and manufactured in accordance with the international quality standards. To manufacture these products our manufacturing team make use of qualitative raw material only which are stringently being examined by our quality experts. Clients can avail from an outstanding array of Arrow Conveyor Chain. These offered Conveyor Chains are developed using optimum quality raw material under the strict supervision of our hardworking team. Moreover, the entire range is manufactured as per industry laid norms to ensure their defect free nature. Offered Chains can be availed in various sizes and grades as per the patrons needs. This chain is the type of chain drive most commonly used for transmission of mechanical power on many kinds of domestic, industrial and agricultural machinery, including conveyors, wire- and tube-drawing machines, printing presses, cars, motorcycles, and bicycles. It consists of a series of short cylindrical rollers held together by side links. It is driven by a toothed wheel called a sprocket. It is a simple, reliable, and efficient means of power transmission. Being a customer focused organization, we are engaged in offering a wide and exotic assortment of Chain for Cement Industry. This precision-engineered range of Chain for Cement Industry is extensively used for handling heavy material and components in various industries. Our products are manufactured in accordance with the industry set quality standards and norms. Our clients can avail this range form us in various configurations to tap their varied demands and requirements. We are engaged in offering a wide range of Chain for Refineries. To manufacture this offered range, our professionals make use of quality-tested material and components procured from reputed market vendors. Our products are extensively used for lifting heavy machinery and containers of oil and other allied products in the Refineries and other allied industries. 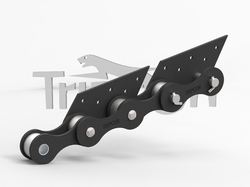 We are highly appreciated in the international market for our exquisite range of Chain with Riveted Attachment. Our offered range of Chains with Riveted attachment is designed and manufactured, in compliance with the industry set quality parameters. These products are extensively used for material handling in diverse industries such as Fertilizer, Metal, Textiles, Cement, Sugar and other Heavy Industries, owing to their high tensile strength and durability. Furthermore, we offer for ensuring hassle free performance our products are stringently examined by our quality experts team. Our organization is efficient to bring forth a comprehensive range of Engineered Conveyor Chains to our valued patrons. Fabrication of these offered conveyor chain products is done by making use quality tested raw material that are sourced from the most faithful vendors of the market. Our range can also be availed in various sizes and dimensions. 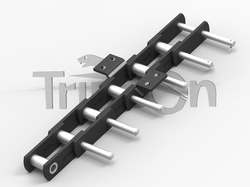 Tripcon is one of the leading manufacturers of Extended Pin Roller and Conveyor chains. Our chains are made from Quality raw materials, also our chain parts are heat treated in enclosed environment to give a good quality hardened product. Due to appropriate selection of quality materials and achieving optimum properties from its high tech heat treatment which can resist high abrasion to ensure a better life of the chain. Full round pins and bushings have consistent press fits for the ultimate in fatigue strength. We make the perfect holes that ensure maximum interference fits. In-house controlled heat treatment processes for balanced hardness to insure good core strength for toughness along with a high case depth for long wear properties. 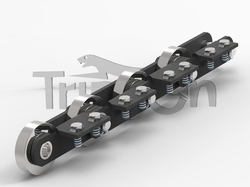 Tripcon offers this roller chains in carbon steel & stainless steel with lot of variants depending upon the requirement of customer and its working conditions and environment. 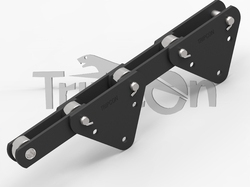 Tripcon also offers roller chains with various kinds of coatings/platings such as Zinc and Nickel. Tripcon also offers Dacrotizing plating. 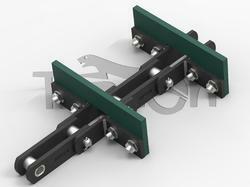 Looking for Special Purpose Conveyor Chains ?